Soon, London will go on two wheels! 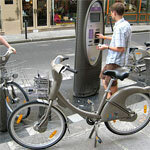 On 18th November, London Mayor Boris Johnson announced the introduction of an easy-access cycle hire scheme in the city in 2010. Some 6000 bikes will be available from 400 locations in zone 1. 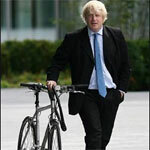 “I believe the work we are carrying out can make the capital a city of cyclists, where to use two wheels is common not curious”, said Johnson, who hopes for a 400 per cent increase in cycle journeys in London by 2025. In fact, the idea did not come from Johnson in the first place. The project was proposed last year by his predecessor, Ken Livingstone. The former Mayor was impressed by the quick success of the Paris Vélib', which was launched in 2007, and wanted to copy this innovative scheme. Ok, it’s bad to copy off one's neighbour; but we’ll say it’s for a good cause. Moreover, we perfectly understand Linvingstone’s wish to imitate the Mayor of Paris, Bertrand Delanoë. His Vélib’ did more than well. With its 20 000 bikes available from nearly 1500 locations, the scheme generated 26 million cycle trips within a year. The Parisian’s craze for the Vélib' is easy to explain. First, it’s very cheap: €29 (£24.2) for an annual subscription, €5 (£4.2) for a 7-day ticket, and €1 (£0.8) for a day. With a one-day pass for instance, you can make as many rides as you like, provided each trip is less than 30 minutes. These low-prices are possible thanks to the contract between the Paris council and the outdoor advertising giant JC Decaux. The company has set up and maintains the scheme, in exchange for exclusive rights to 1628 Paris billboards. Secondly, it is very easy to find a Vélib’. The nearest service point is never far away – one every 300 meters. It means they are 4.4 times more densely grouped than tube stations. And soon, the grey bikes will also be available in the near suburbs of the French capital. So, for short journeys, shared bicycles are faster, cheaper and easier than public transport. No surprise then that it was so largely adopted by the Parisians. But London is not Paris; and the inhabitants of the two capitals do not have the same habits. The first time I said I wanted to cycle to work, all the reactions I heard were: “Oh my God, you’re crazy”. I guessed cycling is not really usual for Londoners. There are not enough cycling paths, a lot of accidents… So, is a scheme similar to Vélib’ relevant and applicable to the Big Smoke? I would answer yes; and I would add that it has a real chance to succeed, since a lot of Londoners seem ready to change their routine. In fact, the British capital has already seen an enormous rise in the number of people cycling, with a 91% increase on the major roads since 2000. It is estimated that there are now approximately half a million cycle journeys a day accros London. In addition, Boris Johnson plans to create twelve “cycle highways” into central London and to convert part of the Victoria Embankment into a cycle lane. If the project works,the Londoners could look forward to less pressure on their overburdened public transport, less traffic jams, and a welcome bonus in terms of a reduction in carbon emissions… So, let’s hope the British scheme will enjoy the success it has found across the Channel!